Earlier today, the memorial by Br. Stanley Rother Wagner, O.S.B. written for Dom Columba Kelly appeared. Br. Stanley captured in a few words the person of Columba –monk and pries and friend– wonderfully well. I am grateful for Brother Stanley’s work. Thanks be to God for Columba: with eschatological hope I am confident that he is now in the embrace of the Most Blessed Trinity. As a musician as well as a theologian, Columba saw his work as not his own – or even of our community’s – but as the work of God. Some scholars and academics may dissect the word “liturgy” to manufacture an agenda, but the monks of Saint Meinrad know even today that the liturgy is God’s work that, through our baptism into Christ’s one priesthood, we are ever-invited to participate in through our respective states in life – lay, clerical, religious, married, and even monastic. Saint Meinrad’s contribution to the work of liturgical renewal after Vatican II came about with God’s providence manifesting itself through the talents of several monks: Fr. Gavin Barnes, whose input on choral recitation still influences our prayer; Fr. Cyprian Davis, whose vast historical knowledge helped hand on the Church’s tradition of liturgical prayer; Fr. 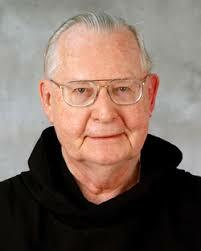 Simeon Daley, who gave to the liturgical renewal an authentic understanding of rubrics and custom; and Fr. Aidan Kavanaugh, one of the more well-known of the twentieth century liturgiologists, who brought an encyclopedic knowledge of liturgical aesthetics and best practices that have influenced extensive numbers of churches beyond the Catholic Church. In those moments of cleaning and solving the Church’s liturgical problems, a friendship blossomed. I no longer saw Columba as an elder confrere, but as my brother. God called us both to Saint Meinrad Archabbey for reasons we one day may be told. For now, though, I remember fondly the informal monastic formation Columba gave me, not just in the areas of liturgy, the Solesmes Method, Gregorian seminology, or a vibrant history lesson; he taught me how to bear wrongs patiently, how to live in community, and, most of all, how God’s grace has a transformative effect over the course of one’s whole life. Columba was many things – a monk, a priest, a theologian, a musician, and a teacher. Beyond these, though, the most important is that he was a disciple of Jesus Christ. He may have had his flaws and quirks like all the rest of us, but he will be remembered for his way of preaching the Good News through a medium that drew people into the very mystery of Salvation: The loving dialogue occurring timelessly between our Heavenly Father, his Sole-Begotten Son, and their Spirit of communion. Fr. Columba did not just bring chanting to the people or people to chanting, but he served as a bridge between Christ and his people; a task he undertook using the gifts and talents our Provident God gave to him during a decisive moment in church history. This will certainly not be the only tribute to make the rounds of the Catholic blog-o-sphere, but I hope it gives some insight into what I learned from a monk who wished to bring Christ’s words closer to people’s lips and, most of all, to their hearts. That is how I will remember my friend and brother, Fr. Columba Kelly, O.S.B. Br. Stanley Rother Wagner, O.S.B. is a junior monk of Saint Meinrad Archabbey. He made first vows, upon the completion of novitiate, in January 2018.